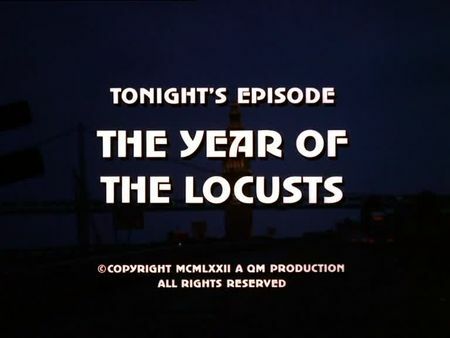 The screencaps for The Year of the Locusts are now accessible on the episodes' page. While investigating the robbery of rare Jade gemstone blocks and the murder of a security officer, Mike Stone accidently notices the return of Angus Ferguson, patriarch of a modern-style Gypsy family, to the Bay Area. The Fergusons, led by the father-and-son team of Angus and Albert, are specialized in settling down, bleeding an entire neighbourhood white, and moving on quickly. However, neither Stone nor the old Ferguson are aware of the fact that the younger generation of the family, much influenced by a greedy son-in-law, has added robbery and murder to their portfolio of flim-flam. We learn that Mike knows the Fergusons for almost a lifetime. He grew up in the same neighbourhood, and he loved Mama Ferguson's special cookies. On the one hand, he is quite biased and convinced that Angus Ferguson would never allow crime becoming part of their business; on the other hand, the cop knows that the members of the family are as thick as thieves, so that help from inside the group is much unlikely. However, the unavoidable dissension in the Ferguson family finally leads the ageing partriarch to assist Stone and Keller in the detention of the culprits. Most of the location filming was done around Ghirardelli Square and inside the Pier 18 warehouse, just south of Ferry Terminal. Short sequences also include the Music Concourse in the Golden Gate Park, a neighbourhood on Telegraph Hill as well as the Financial District on California Street.